The remainder of the amount due will be charged to your credit card 1 week prior to arrival. Should numbers or room selection change, the per person deposit times the number of people who actually travelled will be deducted from the total accommodation charge levvied by the hostel. The following group types are not accepted by this hostel: Junior / Primary School, Business Trip If you have misrepresented the type of group you are booking for, your booking may be cancelled by the hostel." 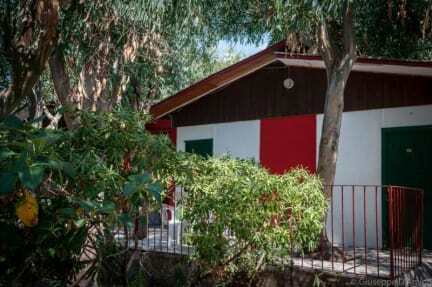 The Villaggio Turistico Europeo is the only hostel in Catania directly located on the beach. It will welcome you on a 6 hectare area immersed in a natural and protected oasis. Not only does it have a gorgeous private sandy beach surrounded by tropical plants, but also a favorable geographical position that will allow you to easily explore the rest of the Island. Indeed, one of its biggest strengths is its large and private golden sandy beach, surrounded by tropical plants and palms and supplied with beach umbrellas made of palm leaves, perfect for enjoying a relaxing sea holiday with your family and friends. There are no extra expenses inside the Village and the use of the beach with its facilities is included.The Village offers to its customers several accommodation possibilities that suit all types of needs which are only a few steps from our wonderful beach.